Last night, in Bucharest alone there were over 10,000 (some sources claiming 20,000) people protesting against the newly elected government. The Romanians are protesting against one very controversial measure they’re planning to adopt: they plan to change the laws so that corrupt politicians that are in jail or are under investigation would be freed and/or have their records cleared. In other words, they are planning to change how corruption or abuse of office are defined by the law codes, offering escape routes to those already under investigation (or already convicted) and, of course, opening many gates for future abuses. Many people consider this measure which was planned to be sneakily introduced and voted by the huge majority the government enjoys, but their plans were messed up by the President and, during the past few days, the protests. In many ways, these recent manifestations reminded me of the Colectiv protests which resulted in the corrupt government falling and one of the best governments in Romania’s post-communist history taking its place. 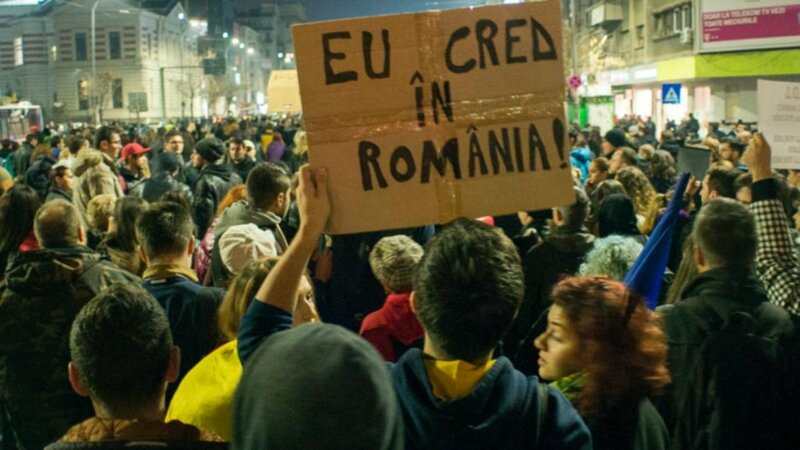 However, the Romanians seem to suffer from short term memory losses as this winter they have voted – and did so in huge numbers – the government they have protested against and managed to throw away in a remarkable, unprecedented feat. And now the same people have the power and they do so with even better numbers than before (they have a majority of about 56%). And, of course, they’re now planning to save their politicians and do what they’re known to do best: look after their interests and shape laws and everything to suit their needs and offer them the freedom to do what they please without risking much. But it seems that the days when the Romanians would just sit back and accept measures they are not agreeing with are done. Last night’s protests are a proof of that and fortunately they manage to draw the World’s attention over these problems. And hopefully that will be enough to make the government reconsider, although the stakes are definitely a lot higher for them and many think – myself included – that they will simply ignore these protests and carry on with these anti-democratic measures. Romania’s President (red jacket) joined the protest. Because that is what these measures are, in the end: anti-democratic. By allowing acts of corruption to go unpunished, the politicians have fewer reasons to worry and more reasons to go ahead and do things like that. By pardoning convicted or investigated politicians, they open up the doors for them to hold public offices again and many believe to offer the governing party’s leader the chance to run for president. Because, yes, the leader of the majoritarian party in Romania’s government, Liviu Dragnea, is under investigation and because of that was not allowed to become the country’s Prime Minister. Reports show that the current prime minister is basically his puppet and most – if not all – of the people in the government are under his influence. And since the party managed to get historic results in the elections – and with Presidential elections coming – he’s planning to pave the way for an easy win. Of course, he still needs laws to be changed and that is what the Romanians are protesting against at the moment. 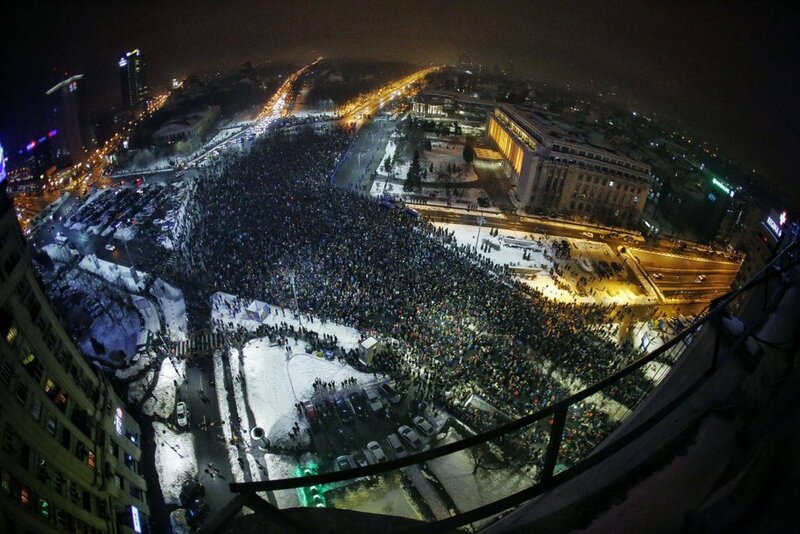 Over 10,000 protesting in Bucharest alone is a large number. 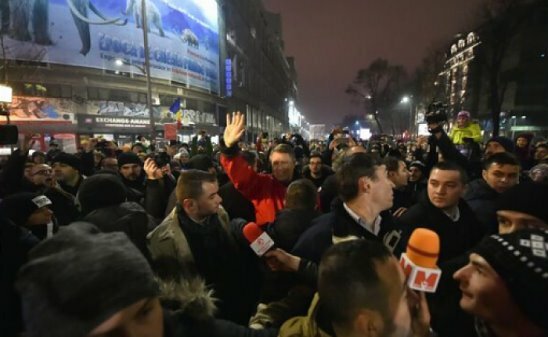 Many public figures, celebrities, TV and Radio hosts but also Romania’s president Klaus Iohannis took part at yesterday’s protests and rumors are that many of the people who actually voted for the current government are against this measure which I believe would set Romania back a lot, hinder progress and take us back to the years after the revolution. This means that, just like that, we’d go back to the 90s. Many people are hoping now – mostly the leading party’s opposition – that the government will fall and many claim that they should step away because the people don’t want them. However, things are a bit more complicated now than they were during the Colectiv tragedy: first and most importantly, the government had just been elected in December and was established in January (yes, they did not waste any time in trying to push their controversial measures!). And second – but less important – 20,000 people protesting in the country doesn’t seem that much when you think that Romania has a population of almost 20 million. I was joking with Kevin – who recently moved to Romania, one of the country’s biggest selling points being the low cost of living – that the current government is perfect for him and those looking for a low cost of living as the country will definitely not benefit from such measures and any growth would be impossible. So there are always people who would benefit from any type of measure but unfortunately many of those who wouldn’t don’t realize it yet. The sad thing is that fake news and manipulation are now an important threat to the human race – not only the big countries are threatened by fake news and photo manipulation, but every single person on this planet. In this case, manipulated photos started to be published online, trying to enrage people against the protestants. I personally believe and hope that such act will soon be punishable by law because this type of manipulation and disinformation is just as dangerous as many crimes out there. But unfortunately these go viral before people realize that they’re fake – and when the proof’s out there showing that it was actually fake, it’s too late. Strange and sad. Either way, I feel that I went away from the protests in Romania, so I’ll stop my ramblings now. Time will tell if these protests manage to stop the government for changing the law in their favor. My gut tells me that they won’t – they are know for defying, over-confidence and ruling for themselves. And unfortunately, this time, they had around 56% of the voting Romanians backing them up and fueling their megalomania. 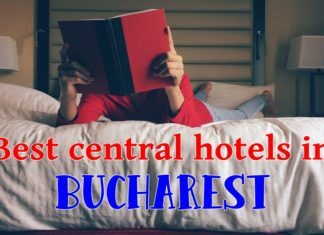 Previous articleFinding a Job in Romania as a Foreigner: How Difficult Is It? Calin: You are right on it!!! I was just going to ask you about this. Are you having any protests in your city? I guess the prime minister has more power than the president. “swapped” jobs with Medvedev. It’s all so confusing to me. I am asking myself what has happened to the world. Trump is the most despicable politician alive, and yet he gets elected anyway. The Romanian “technocrat” government does very well, and yet the same corrupt PSD party is returned to government only a few years after Iohannis won an upset victory over the same party’s candidate in the presidential election. It’s as if people have forgotten right from wrong, as if they want to “cut their nose off to spite their face.” “Fake news” has actually been with us for a long time, certainly since the Soviet Union had a special “Disinformation” Dept in the KGB. This department made up stories, planted them in friendly foreign press outlets, and then quoted these as independent sources. For instance, they made up the story that the USA had created an “ethnic bomb” which only killed Blacks and not Whites just before the Los Angeles Olympics in the USA. This story was designed to outrage African nations into not sending their athletes there. The story was planted in an Indian communist newspaper where it soon spread all over the world. The difference today is that the onetime gatekeepers of “all the news that’s fit to print,” the major Western newspapers and TV networks, are now very weak and must compete with countless Internet sites like Breitbart News which gleefully disseminate fake news and stories. And we must admit that many people in the West are depraved enough to gobble up this disinformation or even create it themselves and spread it via social media. I really fear for our future. I think Romania can be excused for succumbing to this tendency since it is a relatively new democracy only since 1990. But what is our excuse in the USA??? Yes, I think that most people can agree that the world took the wrong turn. It’s difficult to explain PSD’s victory, especially since they didn’t just get votes from the elderly, as they did in the past, but they got a huge number of votes from younger people as well. This proves just how much power money offers: none of the other political parties have the funds required to bring their messages (fake or not) to the masses and many people still believe that if everybody talks about Mr. X, then Mr. X is the good guy. Wow! I too wonder what has happened to the world like Stuart says above. I feel like people are just sheep at this point, easily led and swayed. Everyone has the attention span of a 2 year old and the politicians everywhere take advantage of that. The short memory you mention is typical. I swear it seems no matter what, anyone who ascends to a position of power gets seduced by it. They cease to care. I hope things don’t turn violent. You know l have been fearful for the future for a while and this doesn’t ease my mind at all? Yes, I know it’s not the first time we agree on this matter. So far the protests were peaceful… but violence is clearly a possibility in the future – and I am not referring to the protests in Romania, unfortunately. This looks to have Dragnea’s fingerprints all over it. Perhaps Timothy meant that Dragnea has pushed through this pardon plan to “exonerate” lots of corrupt officials, including himself, so that the PSD can continue in its corrupt ways. Dragnea was thwarted in his wish to become Prime Minister because he himself had been convicted of voting fraud. He plans to have himself pardoned! No, that Dragnea had his own pardon planned from the beginning so he can then be PM. 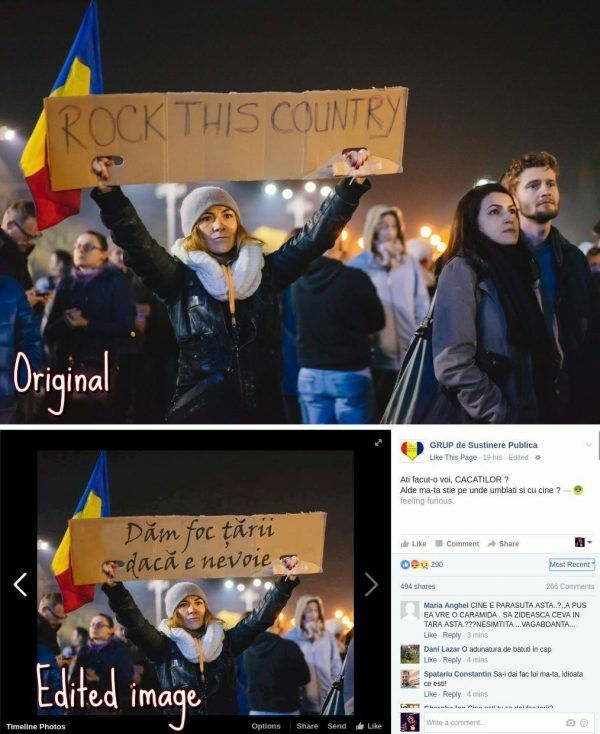 I support the protesters and a corruption free Romania.